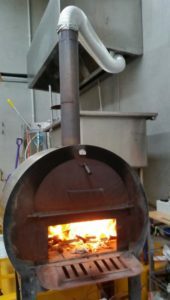 With the cooler months upon us, we have decided to offer warming pizzas cooked in a new (to us) wood fired pizza oven. Still learning to drive the oven, it is setup inside and hooked up to our brew house exhaust system. Testing is progressing well with the family having fresh pizza for dinner earlier this week.